I attended the Remembrance Day service at my local church and afterwards at the cenotaph, where thoughts inevitably focused on lost comrades, friends and loved ones. 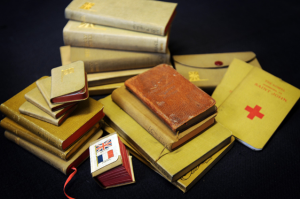 Our vicar told the congregation how all the 5.7 million British soldiers, sailors and airmen in World War 1 were issued with bibles before joining the fray. I felt there was an implied criticism of the current military, although that may have been more about my sensibilities than his intent. It did remind me that when I joined the Royal Marines a Bible was the first thing I was given, before I was issued boots, beret or bullets! The padre was pleased and greatly reassured when I told him after the service. I have that Bible still. The week before I was facilitating a trio of activities for employees at Boulby mine as part of their annual Safety Week. Collectively they fired over 7,000 arrows at the archery stance, ascended over 3900 metres on the climbing walls – the equivalent of scaling the Eiger! – and lit 320 fires using steels, all to give a different perspective on safety. The two key themes of the week were around personal safety and management of major hazards. The review sessions demonstrated a high degree of awareness and highlighted several areas for improvement. For me the issues were reinforced by one manager who arrived late, ignored safety signs, missed the safety briefing and then complained that he had limited time on the archery round. Hardly a good example. What do you want from the people in your organisation? Do you want them to follow your orders slavishly or to think for themselves and help you to build the business? Surely we want people to be committed, not compliant but how do we foster that? I believe that it is about knowing what you want and how you want to be seen, to behave and be remembered. I am not advocating the all too familiar, broad sweeping and ultimately meaningless mission statements of the corporate world. I am, rather, for asking the question and debating it honestly, openly and freely, “what do we stand for?” This requires that we examine our values and intentions, avoiding the bland platitudes and hyperbolic rantings of the uninformed, the lazy minds who accept and adopt opinions without thinking or evaluating for themselves. This entry was posted in Uncategorized by TrainUser. Bookmark the permalink.